The Durango High School cross country teams fared well at the Liberty Bell Cross Country Invitational hosted by Heritage High School in Littleton on Saturday as the boys team took sixth while the girls finished 16th. On the boys side, the Demons finished with 209 points and were led by Noah Bodewes, who finished 17th overall, crossing the finish line with a time of 15 minutes and 58 seconds flat. Marcus Flint finished second for the Demons with a time of 16:20.49 seconds while Teslin Stecher finished not far behind in 48th with a time of 16:26.90. Mountain Vista won the meet with 110 points. On the girls side, Madeleine Burns set a new Durango High School record when she crossed the finish line in a time of 18:10.30 seconds, finishing just outside of the top 10 in 11th. The Demons finished in the middle of the pack at 16th thanks in part to Kiara Hamlin, who finished in second for the Demons with a time of 20:02.30 and 70th overall, while Angela McManus rounded out the top three for Durango, crossing the line in a time of 20:06.50 and 77th overall. Mountain Vista also won the girls race finishing with 34 points. “Overall, it was an exciting race, great competition and it’s going to make us better down the road,” said Demons head coach Ken Flint. The Bayfield cross country team competed over the weekend at the Joe Vigil Open in Alamosa and the boys took ninth overall with 319 points. Their highest finisher was Jonas Nanaeto, who finished 29th overall with a time of 17:55.30 seconds, while his teammate, Elco Garcia, finished right behind him in 30th place with a time of 17:56.60. For the Wolverine girls, the highest finisher was Claire Hufnagel, who came in 94th with a time of 24:34.50. 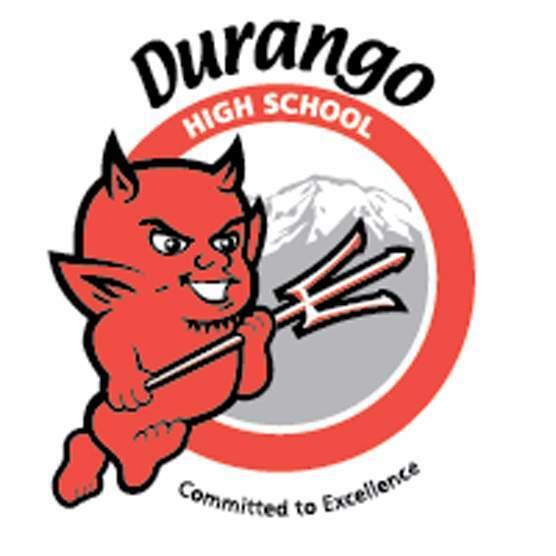 SoccerDurango 4, The Academy 0The Durango High School boys soccer team rebounded after its first loss of the season Friday night by defeating Class 4A No. 6 The Academy in Westminster Friday night 4-0. The Demons scored all four goals in the second half, starting in the first minute of the second half when Logan Fullington scored and was assisted by Lance Townsend. DHS struck 10 minutes later when Leland Heinicke scored his seventh goal of the season and was assisted by Ren Beasley. Caleb Lachelt found the back of the net five minutes later on the hour mark and was assisted by Fullington, giving the Demons a commanding 3-0 lead in just 15 minutes. Townsend added the icing on the cake with a goal in the 68th minute. Levi Larson got his second start in goal and recorded seven saves and the first shut out of the year for Durango. Head coach Aaron Champenoy thought the Demons regrouped well after the scoreless first half. The Demons (5-1) will travel to Farmington, New Mexico where they will take on Piedra Vista on Tuesday. Crested Butte 9, Bayfield 0Crested Butte defeated Bayfield 9-0 over the weekend. The Titans got on the board in the 17th minute when Tommy Linehan found the back of the net in the eighth minute. The Titans added three more before the halftime whistle sounded. The scoring did not stop there as Linehan added a second shortly after the break. Crested Butte would go on to score four more times in the half, cruising to victory. Caleb Lake entered the second half for the Wolverines in goal and made 13 saves in the loss. SoftballDurango 18-27, Aspen 8-4Over the weekend the Durango High School softball team won both games in a doubleheader against Aspen. The Demons (9-3) routed Aspen both games, winning 18-8 and 27-4. In game one, Morgan Allen got the victory on the mound and had two doubles, a single and two RBIs. Lily Longan had two triples and scored three runs and had three RBIs while Virginia Herr had two doubles and a triple and four RBIs. In the second game, the bats continued to be red-hot for DHS as Teagan Kehm was in the circle and got the victory. Autumn Rymerson had the biggest game for the Demons, with a single, double, home run and seven RBIs and five runs scored. Tori Raybourn had a single, double, home run and four RBIs. TennisThe Durango High School boys tennis team fought hard over the weekend at the Western Slope Open in Grand Junction but did not crack the top 10 as a team. The Demons finished 13th out of 16 teams and faced stiff competition among some of the best programs in the state, including Regis Jesuit, the No. 1 team in the state. The Demons No. 1 singles player, Ethan Craig, finished in eighth overall in the singles tournament. Meanwhile, the No. 4 doubles pair of Axel Bourey and Jonah DiGacamo advanced to the third round of the loser’s bracket and the run included a victory against regional foe Steamboat, who the Demons usually have to face off in the state playoffs. The Demons will travel to Colorado Springs next weekend when they will play Air Academy at 4 p.m. on Friday and Coronado at 8:30 a.m. on Saturday. VolleyballOuray 3, Ignacio 0Ouray swept Ignacio in straight sets on Saturday, defeating the Bobcats 25-23, 25-14 and 25-19. The Bobcats (3-2) will host Montezuma-Cortez at 4 p.m. on Thursday.